Sam Ueda, president of Tsubaki of Canada Limited (TCL) from April 2008 to May 2013, will be returning to Japan to take on a new role as the manager of Corporate Planning Department at Tsubakimoto Chain Co. We thank Sam for his strong leadership at TCL and wish him the very best! It is with great pleasure that we announce the appointment of Mr. Kevin Powers as the new President of Tsubaki of Canada Limited. 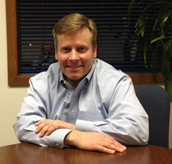 Kevin knows our company well as he has previously served as a member of our Board of Directors. Kevin has been the President of U.S. Tsubaki (USTP) since 2005 and will continue to serve in this role. We welcome Kevin to our team as we strive to become an even stronger market leader and Canadian manufacturer. The optimizer can be found in various stages of the sawmilling process. It is used to detect lumber defects such as knots, stains, dimensional issues, splits, wane, beveled edges, warps etc… It is a vital piece of equipment to a sawmill’s bottom line. Equipped with a series of sensors, the optimizer can generate up to 3000 scans per second. Because of this, the chains which convey the boards can’t be lubricated as the lubricant ends up covering the sensors which compromises lumber quality coming off the line. Optimizer chains normally consist of 4 or 5 strands of attachment chain running parallel to one another. Running chain Un-lubricated can cause one or more strands to elongate at a faster rate than the others which in turn creates timing issues given the attachments no longer line up. Unsynchronized chains can lead to costly jam-ups. Running chain un-lubricated drastically reduces chain life. In order to address the aforementioned problems, we recommended the customer convert the application from standard RS80 attachment chain, to RS80 Lambda Self Lubricating attachment chain. With standard RS80 attachment chain, frequent chain tensioning would be required, and the end user would replace the chains every 18 months due to elongation caused by the lack of lubrication. Lambda Self Lube was installed on this customer’s optimizer in July 2010 (35 months) and is still going strong. A recent inspection of the chains in question showed zero elongation. Current savings after replacing standard chain with Lambda are now up to over $6,000 (not counting production downtime). Sometimes strong is not strong enough. Sometimes upsizing a chain for an application is out of the question. Sometimes a better solution is needed. Enter Tsubaki Super Chain. Super chain is a great all around problem solver when it comes to drive chain selections for heavy and problematic applications. Super chains are dimensionally equivalent to ASME standard series roller chain. The unique design of the Super series link plates is what delivers exceptional performance. The link plate holes are critically formed and are next to perfect roundness to improve contact area between the pin and plate. This helps to provide a superior press fit. The link plates are also ball drifted to improve allowable tension by 25% - 30%. Pins are through hardened to resist heavy shock loading. 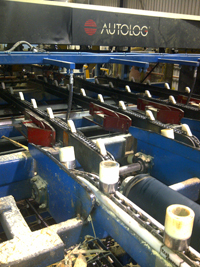 Along with these improvements, the link plates also receive standard shot peening for added fatigue resistance. The wider waist of the link plate adds material to the cross section for the rigors of heavy duty applications. All of these improvements result in horsepower ratings in excess of 30% over the same size standard ASME chain. This allows the user to increase the strength capabilities of a chain on a given application without having to upsize the chain. In some cases, Super chain can replace the next size ASME chain resulting in lower mass to be moved and therefore lower energy consumption. Another great feature of the Super chain is that in multi strand applications there is no need to replace the sprockets with heavy series ones. Standard ASME sprockets can be used all around. This is especially critical in applications where space is at a premium. Some examples of where Super chain is most useful are above ground drill heads in the mining industry, heavy duty mixers, & crane booms. Super chain can overcome design hurdles and help to maximize profits while staving off expensive downtime.